1) Don’t leave school on Friday until you’ve prepared for Monday morning. It’s tempting to run out of the classroom as soon as possible before the weekend, but you’ll enjoy your time off so much more if you make Monday’s photocopies, set up the supplies you need for projects, and get your classroom in a reasonably neat and organized state before heading out the door. Knowing that you’re not returning to a messy classroom and huge list of things to do before students arrive on Monday will give you some peace over the weekend. 2) Wait until Sunday morning to decide how much time you’re going to allot to school work. I don’t like to make that decision in advance because things pop up at the last minute and then I feel stressed if my plans get messed up. Waiting until Sunday morning to decide allows me to roll with the punches if I’m not feeling well or if an opportunity to do something fun arises. 3) Choose an amount of time that fits your life–don’t base it on how much work needs to get done. 4) Make your work time a true work-only period. If you choose to dedicate the hours of 2-5 pm to grading papers, do it whole-heartedly. Don’t check Facebook, text a friend, and watch TV at the same time. I’m speaking from experience here: that will only prolong the amount of time you perceive yourself as working. Before you know it, the whole day will be gone and you’ll be moaning about how all you did was work when the truth is that you only truly worked for an hour or two. Staying focused is tough, but it’s a lot easier for me if I know that I’m sticking to the time I allotted–if I’m really going to put away the work at 5 pm, I don’t have time to peruse Pinterest…and I know that I can go on Pinterest guilt-free afterward. 5) Set a time frame for thinking about school on Sunday. Part of the reason why Sunday is so stressful is that our minds are constantly wandering into the future, running through the list of things we still need to get done and worrying about what the week will hold. You can limit this by giving yourself 5-15 minutes to think about the week ahead: I like to have a short time for this in the morning before I do the day’s work, and then again after I finish the work to give myself some closure. Plan out strategies for dealing with challenging issues. Write down any additional tasks you need to complete. Daydream about activities you want to do with your students, and envision yourself having a successful week. 6) Train yourself not to think about school outside of the time you allotted. In Awakened: Change Your Mindset to Transform Your Teaching, I share four mental strategies for dealing with unwanted thoughts: dismiss, distract, reject, and replace. That’s what you need to do when you’re supposed to be relaxing and your mind keeps returning to all the pressures of teaching. Tell yourself, I am rejecting these thoughts about school because they’re not productive. I’m choosing to replace them with the thought that when Monday morning comes, I can trust myself to know what to do, so I don’t need to think about it right now. Then distract yourself by doing something more enjoyable, and dismiss any thoughts about school that continue to arise. It takes awhile to discipline your mind to stay in the present moment, but each time you do it, you’re breaking those unhealthy habits and making it easier for you to be mindful next time. 7) Give yourself at least one thing to look forward to on Monday. Is there a student who always makes you laugh? A fun colleague you’ll have lunch with? A lesson you particularly enjoy teaching? A project you know you’ll get to complete? If you can’t think of anything, create something to look forward to! One year when I had a particularly challenging class, I built a little bright spot into my daily schedule for each day of the week. On Mondays, a co-worker and I took turns bringing breakfast to school and we ate together in her classroom and chatted about our weekend before our workday hours officially started. On Tuesdays, I enrolled my students in a virtual class that was taught by the school district remotely, giving me an extra break for 30 minutes. On Wednesdays, I team-taught a reading lesson with an enthusiastic coworker who always got me excited about our work. So, whenever I started to feel dread about going into school the next day, I remembered the fun activity I had planned and stayed focused on that, instead of whatever was stressing me out. How do you beat the Sunday night blues? Please share your tips (or struggles) in the comments. Remember–you are not alone in this! God I hate Sunday nights so much. Thank you for these ideas. You mean I’m not the only one having so much trouble enjoying my weekends? NOT AT ALL…this has been my life for three years! I like the idea of setting aside time in Sunday for schoolwork. I can easily spend large chunks of time over the weekend working on school stuff and feel like I’ve had little rest. The one thing I can’t manage is prepping on Friday afternoon for Monday – I’m just too exhausted! I have decided to make Saturday all mine – no school stuff! My students don’t leave until 4:15 and the school closes shortly thereafter. It’s difficult to get things done on a Friday night and Saturdays are always so busy. Then, before you know it, Sunday rolls around and the stress sets in. My solution has been to use Thursday to plan for the following week. As a middle school teacher, I know how things are ending for the week enough and don’t feel the voice of Weekend calling for me. I have dealt with some anxiety on Thursday mornings, but I get to enjoy Friday and truly forget about school for the weekend (unless I decide to set aside a couple hours to grade). I wouldn’t do it any other way if I had the choice because I need separation for sanity! I can personally attest to the first tip. There’s nothing like peace of mind for the weekend when you leave everything ready on Friday evening. You could totally forget about work during Sunday and come in Monday morning and it will trigger an epiphany, an “Oh yeah!”, when you see the objective and agenda already written on the board, lol. Thanks for this! I need to work on number 4. If I do that I might just be able to control my working hours. Thank you so much for sharing these. It can get overwhelming at times and these ideas help to deal with that. I really pretty much function this way as a classroom teacher, but still find myself stressing about the week ahead. I do however feel prepared, just dread the possible bumps in they road and the curve(s) that I’ll probably get thrown….part of being a teacher….flexibility….it’s hard, but completely necessary. Yes, anticipating problems is a big issue. There have been studies showing that 90% of the things we worry about never come to pass. I find it helpful to remind myself of that when I get anxious thinking about everything that could go wrong. I have finally, after 27 years of this profession, mastered the art of “shutting it off” on the weekends and holiday breaks. There have been times where I have felt overly disorganized during the week as a result, but the trade off of having concentrated down-time weighs out. It’s not really that I have found great strategies to allow this to happen. I have just come to realize that my teaching doesn’t get any better if I’ve obsessed and stressed about work all weekend or have chosen to “shut it off.” It’s a choice. I do my very best during the week, and then let it go for my two days of family and me time. One thing for which I could use some ideas is keeping up with grading papers. I tend to pile them up for days, and then have to do a “grading marathon!” At the end of each day, my focus is on preparing the next day and any extra paperwork/meetings that may be required. I would love to find a way that makes the grading less grueling…any ideas? I try to find something interesting to share with my students ranging from a youtube video that relates to our area of study to a song. This gets me super excited for Monday to be able to tell them about it. Love your ideas! #4 is the one that rang true with me the most! The problem that I always encounter has one simple title: CHILDREN! If I’m going to work I have to inform my husband about my “working hours” so that he will step in if someone is hungry or there’s a squabble. Thank God I have him…sometimes I think that I should be a Starbucks dweller and do my work there! Great idea to have “working hours” at home when you family isn’t supposed to disturb you! I love these tips. I just started a new grade and population and we have limited materials in the school that are appropriate for my students and I have a very wide range of abilities. I feel like I am spending all of my waking hours doing school things, thinking about school, worrying about not doing enough….I need to find ways to get a better balance to my life, especially my weekends. Amen and thank-you. This is exactly what I needed to read today. I’ve been fretting in a fog of depression and jolts of panic for hours today. I didn’t get to my plans on Friday, so I will set aside from 6-9 tonight to work. Right now I need to continue to rest and rejuvenate and dismiss thoughts of school and housework. Again, thank-you! Really helpful tips 🙂 Particularly liked the last one about focussing on something I am looking forward to on Monday or creating them if nothing stands out. I ride in a van pool and so my time on Fridays (or any day for that matter) is limited. I take Saturdays off but still hate Sundays. I need to make a schedule and plan to work a few hours. I agree, doing work on the couch with the TV on is unproductive for me. Thanks for reminding me I’m not alone. Wow. Thank you for your advice. It is so comforting to hear the way I feel from another teacher. Now I know I am not alone. Hilarious! And I agree, that cookie butter is pretty amazing stuff. I have found that the right anxiety meds are the only things that keep me from obsessing about school every hour that I’m not there. Unfortunately, it took me 12 years and a trip to the psych ward to figure it out, but I’ve never felt better. I love my students and look forward to teaching them every day. I may occasionally leave work without everything squared away, but I can go with the flow and not sweat the small stuff any more. A whole, healthy body and mind are the best thing that I can provide for my students! Susan, thanks for being brave enough to say this. When anxiety and depression are biochemical in their primary source, the right medication can mean the difference between coping and not coping. I recently discovered that my B12 levels were low enough to warrant treatment, and since treatment commencing life has been better. The other trick was to eliminate Coke (Coca Cola) from my diet! Amazing what a difference it makes. 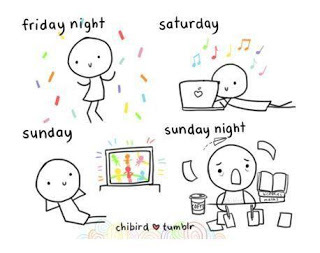 That sense of dread every Sunday night is so familiar! Thanks for the great list! I try to leave the weekends open for family– its a goal, sometimes I make it, sometimes I don’t. As always, this blog and the commenters make me feel like I am not alone! I especially like the reminder that the work is never done, so decide how much to do and then leave. I think I should put that up on my desk where I can’t miss it. Finally, a word about #6- retraining my brain. For me, as a new teacher in a new grade in a new state in a charter school with out an actual curriculum (beyond a vague “teach the core” directive) and no materials other than what I purchase on my own…Don’t spend time researching/looking at freebies on TPT or TeachersNotebook. While I’ve discovered so many great resources (and thanks if you are one of those amazing folks who posts great activities for free or low cost-Angela, I’m talking to you!) I also know that just hanging around and surfing the internet for teaching resources in my free time is NOT helping me unwind and relax. As a new, young teacher, many years ago, I had a principal who required that lesson plans for the following week must be left in plain sight on each teacher’s desk before he/she left on Friday. AND … he would spot check to make sure we were following this rule. Though I admired and respected him and very much loved working with him, I always resented being made to do this task on his schedule. It wasn’t until I moved to a different city and job that I came to realize all the ridiculous weekend anxiety my former principal had helped his teachers avoid. I admit that without him it was hard to muster the discipline to go back to the standard he had set for us but I did. Thank you, Mr. Sefcik, wherever you are! I am probably the only teacher who gets the Friday night blues instead! I live alone, so I miss my students fiercely over the weekend, and I am constantly thinking up new things I want to do with them. I am also, however, a graduate student, so I need to focus on my own school work on the weekends. I find that using a small notebook to jot down things about work and “put them away” helps me stay focused on my other weekend activities, and not lose my new ideas or exciting approaches to writing and grammar that cross my mind. This psychological approach to filing our worries and distractions is actually a great way to fall asleep when school worries are nagging at you at bedtime, as well. Write down the issue, and you know it will be there in the morning. Until then, close the book and go to sleep. What a lovely perspective! Thank you for sharing, Diana. knowing how long your unit is & how many days it will take to complete is step one. Planning ahead & getting 90% of your next week ready on Friday is step 2. (Leave yourself a post it of what is left) step 2. Finally complete any copies needed step 3. I can relate very much to this post! I seem to spend most of my weekends preparing for the following week, not spending much time relaxing with my family. By Sunday night I am still stressed and feel like I go out tired on Monday. The best tip here is # 1 for me- that little extra time spent preparing on Friday may make the difference. Thanks Angela! These tips really spoke to me. I am still trying to get in the groove of everything. It’s nice just to know that others struggle with this as well! Thanks for the advice! Most of my department (English) has Silent Sustained Reading on Mondays for All of our classes. Makes going in on Monday threatening, it promotes sustained reading and gives me my weekends back. I spend about 15 min modeling good reading behavior and the other time doing any work I need to get ready for the week. My students are told ahead of time so they know when I switch gears it is for their benefit. Has been wonderful. After almost 35 years in education l have retired,but can truly relate to this article.Sometimes l miss the job,but l do not miss the bag of student work that resided in my car. I came to resent it.Finally,even after trying many of these tips ,l had to give up my career due to exhaustion and health concerns. Now l need to find something else ,but will use many of these strategies when l do. Thank you for this. I am a first year teacher, and I am really stuggling. I’m used to being the best at everything I do. I’ve literally never failed at anything, and having my own classroom makes me feel like a failure on a daily basis. I can never be as perfect as I want to be or get everything done that needs to be done, and it is extremely hard for me to accept that it’s okay to not be perfect or finish all the work. I’ve even had to start taking anti-depressants because it’s become so overwhelming and hopeless to me. It’s nice to know that even veteran teachers get stressed on Sundays and dread the upcoming week from time to time. I had a great cooperating teacher when I did my student teaching, and I am working at the same school with her again this year. She has been really great about trying to keep me from focusing too much of my life on school. She even forced me to go to a dance class with her after school. I will be adding some of your tips to the ones she has given me, and hopefully I can get to a point where I don’t feel so stressed ALL the time. Caitlin, I’m going to be talking about this on an upcoming podcast episode (Where Can a First Year Teacher Really Cut Corners?) I hope it’s helpful for you! You might also want to check out the new 40 Hour Workweek Club (link at the top of this page.) Having the support of other teachers as you learn to work more efficiently could be just the thing you need! Hang in there. It’s going to get better! For me, I’ve had so many negative experiences with students disrespecting me over the last three years. I’ve been poisoned and picked on through the wolf-pack mentality of the children who didn’t like me (this was last year and still I feel the effects this school year- some students didn’t want to be in my class and dropped 🙁 ). That is the main reason why I feel anxious about work on Sunday evenings. I’m also thinking about going to the psych ward. I still enjoy my job, but I’ve also lost some interest in the subject I teach.How does one continue to have interest day in and day out? That and the disrespect have worn me down. I’m returning to work full-time in April, and I’m dreading these feelings. I know them so well.